What is meant by an “Any Energy” efficiency curve for a particle detector? So I'm simulating a silicon detector with an electron source incident on it. 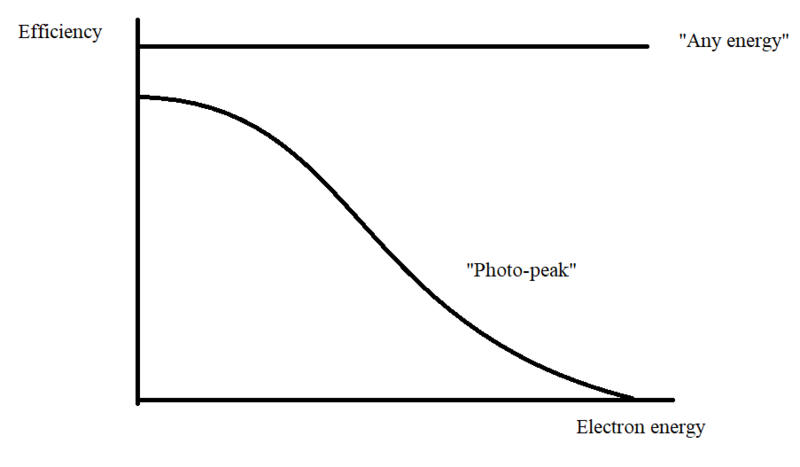 I need to get 2 efficiency curves, one "photo-peak" and one "any energy". The only way I can imagine this graph being the result is if "any energy" actually means total or absolute efficiency, which is found using the ratio of the total registered events with respect to events emitted. This way, I can imagine that my graph should be a horizontal straight line (or near enough). Is this the case? Browse other questions tagged particle-physics particle-detectors or ask your own question. Superconducting loop as a particle detector? How to intergate the cross section over the surface of a detector?